Torretas servem como um dos principais obstáculos na série Portal. Armadas com munição quase ilimitada e precisão mortal, elas tentarão matar cobaias assim que as avistarem. As Torretas padrão são dubladas por Ellen McLain (Inglês) e as Torretas Defeituosas são dubladas por Nolan North (Inglês). Torretas Sentinela são robôs trípodes em miniatura que aparecem em todos os jogos da série Portal. Elas são incapazes de se mover, mas conseguem abrir cada lado de seus chassis (seus "braços") horizontalmente revelando as suas metralhadoras. A parte central do chassi abriga um olho vermelho, que emite um laser usado como mira. Quase todo o seu interior é usado para armazenar uma quantidade absurda de munição, explicando assim o suprimento quase ilimitado de munição ao atirar. De acordo com o trailer "Torretas" de Portal 2, as torretas usam mecanismos de mola para acelerar a bala, incluindo o cartucho, que podem explicar como o jogador consegue sobreviver ao ser atingindo pela torreta várias vezes. Quando o jogador está fora da mira da torreta, elas entram em modo de espera e continuam imóveis com as suas armas encolhidas. No entanto, ao entrar no seu campo de visão, as torretas rapidamente revelam as suas armas após saudarem o pobre desafortunado antes de abrirem fogo. Elas continuarão atirando até que o alvo morra ou saía do campo de visão. Caso o alvo saia do campo de visão, elas procurarão brevemente pela cobaia de testes (como indicado pela movimentação do seu laser) e entraram em modo de espera. Torretas podem ser evitadas, desativadas ou destruídas de várias maneiras. A mais comum é derrubá-las, fazendo com que elas enlouqueçam e atirem loucamente antes de serem desativadas. Isso pode ser feito pegando e soltando-as no chão ou usando qualquer objeto para derrubá-las. Além disso, o Feixe Luminoso de Desencorajamento ou a Grelha de Emancipação pode ser usada para destruí-las. Elas também emitem um longo som de "dor" se jogadas em um desintegrador. Em Portal, as torretas atirarão no vidro à prova de balas caso o jogador esteja do outro lado. Em Portal 2, entretanto, as torretas apenas seguem o jogador atrás do vidro. The Rocket Turret is a unique enemy seen at the end of Portal. It appears as a raw personality core outfitted with a rocket launcher. Upon activation, it will slowly lock onto Chell and emit a sound before firing a rocket. Unlike Sentry turrets, it cannot be disabled or destroyed by the player. 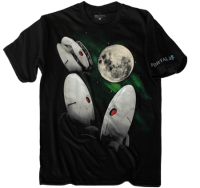 It plays a vital role in the battle with GLaDOS, as rockets need to be sent through portals in order to hit her, causing personality cores to detach from her. Rockets can also be redirected by Chell to shatter the observation windows and other glass-made objects including a Pneumatic Diversity Vent throughout the offices and maintenance areas of the Enrichment Center. Rocket Turrets used to play a major role in Portal 2[citação necessária], but were later cut. 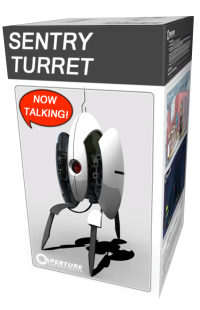 Defective Turrets, referred to as "Crap Turrets" by Wheatley, are incomplete, wrongly assembled and ammo-less versions of the Sentry Turrets introduced in Portal 2. 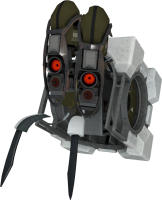 Unlike normal Sentry Turrets, Defective Turrets have a more humorous and sarcastic dialogue, and speak in a masculine, less robotic voice with a Texas-like accent. They are harmless to Chell, many times making comments such as "If anyone asks, I killed you". Their voice lines seem to imply they are blind, but they are still aware of Chell's presence. They are first encountered in chapter 5, The Escape. In the game's co-op campaign, the Defective Turrets appear as obstacles for Atlas and P-body throughout the Mobility Gels testing course. These Turrets appear to be as fully functional as regular Sentry Turrets and possess the innocent and feminine voice tones as they should. The only difference from regular Turrets is that they have been defaced. One Defective Turret in the final test chamber of this test course has been evidently reconfigured by someone, as instead of serving as a typical testing obstacle, before dying it reveals that it "needs to protect the humans". Frankenturrets are bizarre Sentry Turret-Weighted Storage Cube hybrids in the single-player campaign of Portal 2. Created by Wheatley in order to complete test chambers when he had no available test subjects, they are first introduced in the chapter, The Itch. Frankenturrets do not speak, and instead emit incomprehensible chirping sounds. They generally serve as Wheatley's replacement for Storage Cubes once Chell is available as his test subject. Their only difference from normal cubes being that Frankenturrets will hop around aimlessly when not placed on a button. When picked up by Chell, they retract their legs inside the cube. If they fall over on their sides or upside down, they will wave their legs trying to get up. 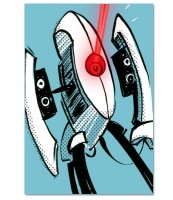 The Prima Donna Turret (meaning First Woman in Italian, a title given to the lead singer, the diva, in an opera), referred by the game files as the Turret Wife, is a bigger and wider Turret featured at the end of Portal 2's single-player campaign during the Turret Opera, after GLaDOS finally allows Chell her freedom of leaving the Enrichment Center. 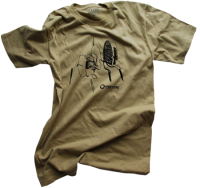 As its name implies, the Prima Donna Turret provides the lead vocals for the Turret Opera. In chapter 6 (The Fall), broken Prima Donna Turrets can be found destroyed and burning on large piles along normal Sentry Turrets. 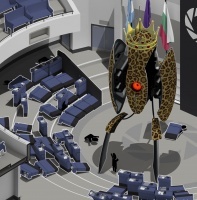 The Animal King Turret is a unique type of turret in the single-player campaign of Portal 2 that is only used in an Aperture Science slideshow to represent an "Animal King Takeover" in the chapter, The Courtesy Call. The Turret is considerably colossal in comparison to its Sentry Turret brethren, and appears to operate the 'arms' on its side in exactly the same way. It can be distinguished from ordinary Turrets by its immense size, crown and leopard skin-detailed chassis. In the context of the slideshow, the Animal King Turret is used as an example of an entity or a form of organism capable of taking control of Earth which "...refuses to, or is incapable of listening to reason". 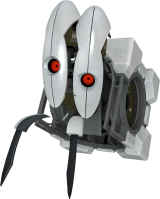 The Animal King Turret appears only once in the entire game, during the single-player ending sequence when Chell is being brought up to the surface by GLaDOS after defeating Wheatley. It appears to be producing the lower bass tones of the Turret Opera. 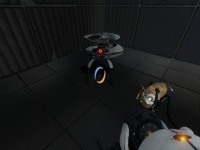 The Hover Turret is an unused Turret found within the game files of Portal 2. It uses the model of the Curiosity Core. It emits a laser, similar to the other types of Turrets, that is coloured light-blue, similarly to the Rocket Turret's targeting laser, and is able to burn the player similar to the burn of the Thermal Discouragement Beam, however unlike the Thermal Discouragement Beam its laser does not provide a barrier for the player's movement, nor does it interact with game mechanics. The Hover Turret can be spawned within Portal 2 via the cheat command ent_create npc_hover_turret. It can also be found in Chapter 8 Test Chamber 1 in Portal 2 by using the noclip command and going throught the wall behind the Level Screen (it should say 1/19) and looking to the left. If you go near it it will make a blue effect and if you have subtitles enabled they will move to the left. Turrets reprise their role as testing hazards to Chell and to Atlas and P-body for the game's co-op campaign, and they appear fairly early in the game. Distinct versions of the Turrets are introduced, including the Defective Turrets and Animal King Turret. 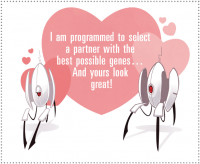 Turret Valentine from Valve's official Portal 2 blog. The Rocket Core from Portal was originally intended to fire lasers instead of rockets, but playtesters thought that a rocket would be more dramatic than a laser slowly melting the glass. Derrube uma torreta com outra torreta. This page was last modified on 4 December 2017, at 05:26.